Port side, is the left-hand side looking forward. Beams – horizontal timbers lying across the ship, to support the decks and connect the two sides. Bends – The thickest outside planking, extending from just below the water line up to the lower deck ports. Counter – the after part of the Bends around the stern. Bowsprit – a wooden or metal spar running out from a ship’s bow, to which the forestays are fastened. Bulwark – raised side of a ship above the deck level to give protection from high seas. 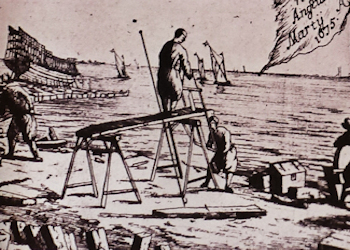 Carlings – short pieces of timber, running fore and aft, connecting one beam to each other, to distribute the strain of the masts, capstans etc. Carvel hulls – a smooth hull is formed by edge joined planks attached to a frame. Caulk – a sealant applied between the ship’s timbers where they abut. Cleat – a T-shaped piece of wood, later metal on a boat or ship, to which ropes are made fast. Clinker hull – wooden planks are fixed to each other with a slight overlap that is bevelled for a tight fit. Cringles – rope loops on sails for attaching ropes. Eyelets – holes punched through the sails for tying the rope onto the yards. Focsle – abbreviation for fore castle that first became Focsole after ‘castles’ on the medieval ships. Garboard Strakes – the lowest planking outside, nearest to the keel, running fore and aft. Grommets – eyelet in a sail finished with strands of rope. Gunwale – the upper edge or planking of the side of a ship. Helm – a wooden wheel or piece of timber attached to the rudder for steering the ship. Keel – the principal timber of a wooden sailing vessel, runs fore and aft at the lowest part of the vessel and forms the foundation for the side timbers. – False Keel – is an additional keel below the main keel that protects the main keel should the ship go aground and also offers greater resistance in preventing the ship from being driven sideways through the water away from the wind. Knees – Pieces of iron joining the beams to the shelf piece and the ship’s side. Knot – a unit of speed equivalent to one nautical mile per hour. Lateen sails – a triangular sail on a long yard at an angle of 45° to the mast. Leeboards / Steerboards – large, flat paddles particularly useful in shallow waters such as rivers and estuaries, when the vessels are carrying heavy loads. Luff – the edge of a fore-and-aft sail next to the mast or stay. Mizzenmast – The mast aft of a ship’s mainmast. Partners – frames of timber fitted on the decks around masts, capstans etc., to give them strength. Ribs – a figurative expression for timbers that form the side of a ship. Rivet – a short metal pin or bolt for holding together two plates of metal, its headless end being beaten out or pressed down when in place. Rudder – flat pieces of wood hinged vertically for steering or directing the course of a ship. This was hung in a straight stern post by pintles and braces. Run – narrowing of the after part of the body of the ship below the water. Shelf piece – timbers that extend all round the ship inside for the beams to rest upon. Sail loft – the place where the sails were cut and sewn. Sailmakers palm – a leather strap worn around the hand for sewing sails with twine. Seasoning – wood, when first cut is classed as ‘green’ and has about 50% moisture content. when it has been allowed to dry, that is seasoned, the wood gains strength, elasticity and durability properties. Shroud – side supporting rope that goes from the top or head of the mast to someplace in line with the bottom or foot of the mast. Each one has the same name as the mast it supports. 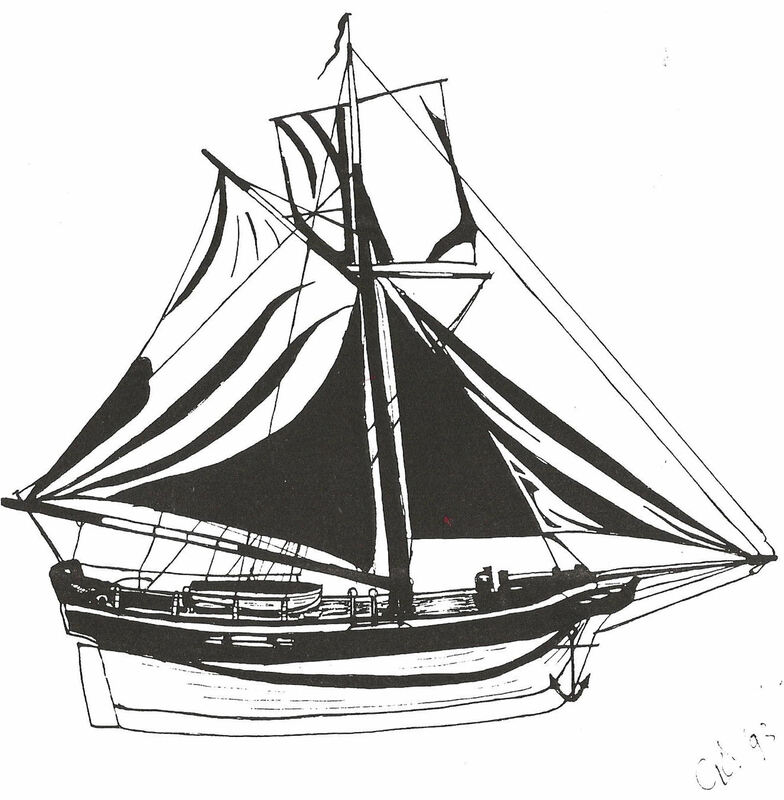 Sloop – a sailing boat with a single mast and a fore-and-aft rig. Sprit Sail – a four-sided, fore-and-aft sail that is carried on a yard below the bowsprit. Square tuck stern – The hull ended in a 90 degree angle that was flat where the rudder was. Stanchions – pillars of wood, later metal, supporting the beam amidships. Stay – a rope supporting any mast from a forward position. Backstays – ropes going from the head of upper masts down to the side of the ship. Each stay and backstay has the same name as the mast it supports. Stem – a piece of timber, which rises from the forepart of the keel to form the bow. Stern Post – rises from the aft part of the keel to form the stern. Tiller – a piece of wood fitted fore and aft into the head of the rudder. Treenails – a wooden bolt used to fasten planks to the timbers and beams. Waterway – this planking extending all round the inside of a ship immediately above the beams. Yards –a cylindrical wooden spar, tapering to each end, secured across a ship’s mast from which a sail is hung. Half yards of gaffs were on the aft side of the mast or on stays or booms. A fore-and-aft sail is a sail not set on a yard. As stated in the opening paragraph, the history of boat and shipbuilding in Dover can be traced back to the Bronze Age, for it is here that what is believed to be the world’s oldest known seagoing vessel was found! The world famous Bronze Age Boat was found on Monday 28 September 1992. At the time the new A20 into Dover was being built and work was about to get underway on the underpass between Bench Street and New Bridge. The underpass was being created to provide pedestrians with the only safe crossing of the new major road to the town’s seafront. On that memorable morning Nick Edwards was digging out earth for the underpass using a Caterpillar excavator for the contractors Norwest Holst. Observing the excavation was Canterbury Archaeological Trust’s Field Director, archaeologist Keith Parfit. The hole was about 18foot wide and when Edwards’ was about 18 foot down Parfit called a halt as he thought that he saw some timbers. On examination, Parfit found that the timbers were ancient and he immediately contacted the consulting engineers, Mott Macdonald and along with Norwest Holst managed to negotiate a three-day halt in order to carry out a further assessment. It quickly became apparent to Parfit that the timbers were part of the lower portion of a boat that was intact apart from the damage to an area caused by the Caterpillar. The timbers, Parfit reported, extended across the full width of the pit, being the mid-section of a very well preserved ancient plank-sewn boat. Further negotiations with the contractors gained an extension to six days to carry out further excavations and assessments with a view to leaving the Boat in situ. However, the road engineers, who carried out an appraisal to look into the possibility to either raising or lowing the underpass, in order to leave the boat where it was, reported that this was not possible. This meant that if the Boat was to be saved and preserved it had to be removed. A team of archaeological experts was called in and they concluded that due to the nature of Boat’s fragile construction, along with the time factor and damage already sustained, to safeguard its key structural features it would be safer to cut it into manageable segments. Intense recording then took place and on Saturday, 3 October, in conjunction with English Heritage conservators, the Boat was cut into ten sections each identified with a different letter. Each section was manoeuvred onto a pallet then stored in custom-built water tanks to slow down decay, while the mid-section was reconstructed using facsimiles of Bronze Age tools. 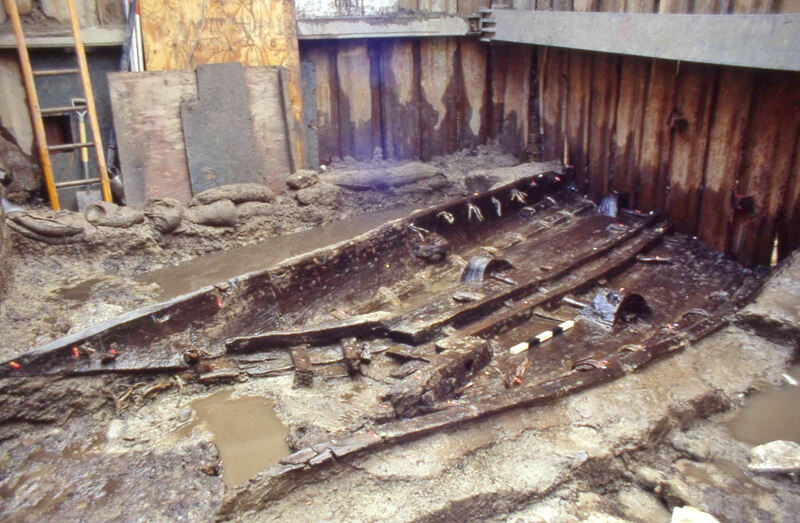 Although not all the Boat was excavated, it was assessed as probably being 42 feet in length (14 metres) and 9feet broad and about 27 feet was lifted. From the boat’s construction, it was concluded that it had been built by a master boat-builder of the Bronze Age era. The Boat has cleats and a central rail carved from two large oak base planks held together by traverse timbers. The side planks are held in place with individual stitches of twisted yew wood with moss caulking between the joints. It was carbon dated to circa 1300BC making it the oldest known sea-going craft in the world. 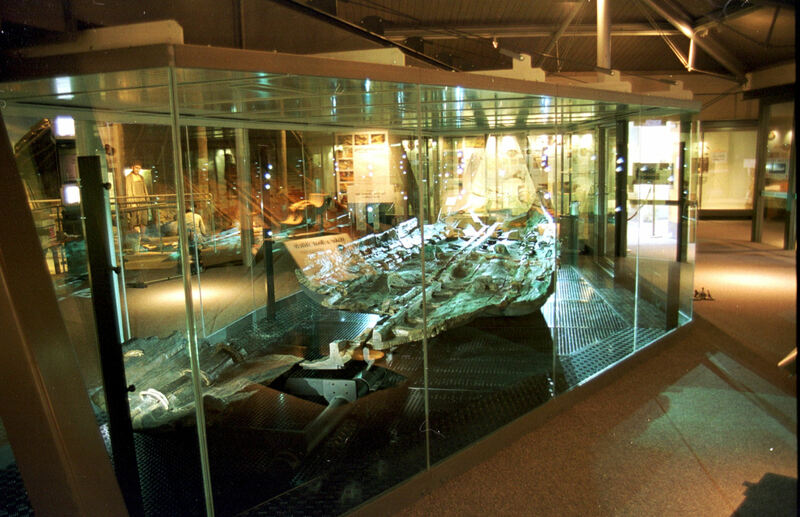 After undergoing special preservation treatment the Bronze Age Boat was brought to the Dover Museum and housed in a specially constructed gallery on the top floor. From the analysis carried out, it is believed that the Boat would have been suitable for carrying a significant cargo at a reasonable speed, in rough weather and possibly over long distances. Although no cargo was found, a small piece of unworked shale at the bottom of the boat proved, on analysis, to originate from Kimmeridge Bay, near Wareham – Dorset, some 160 miles to the west of Dover. November 1999 saw the official opening of the Bronze Age Boat’s specially created exhibition by Robert Leigh-Pemberton, Baron Kingsdown (1926-2013) former Lord Lieutenant of Kent (1982-2002). And on 20 July 2005 Her Majesty, Queen Elizabeth II visited the museum specially to see the Bronze Age Boat. At the time when the Bronze Age Boat was traversing the sea off Dover, the River Dour – the 7-mile river that serves Dover – was much wider and deeper than today, with wide tributaries. The tributaries were on the west side of the valley and over time they cut the chalk hills into broad almost parallel valleys we see today. The east side of the Dour valley lacked any such tributaries, but nailbournes – intermittent streams fed by underground springs – were, and still are, in abundance. Archaeological evidence strongly suggests that there was a significant growth in the population of the area in the Bronze Age and this was confirmed on 14 August 1974. That day, divers Simon Stevens and Mike Hadlow of the Dover Sub-Aqua Club found bronze artefacts dating from around 1100 BC at Langdon Bay, to the east of the present Dover harbour. These included winged daggers and spearheads. Over the following years some 400 similar items, as well as jewellery, have been recovered. Most of these are now in the British Museum but there is a small display in Dover Museum. These findings have led to the speculation that they were the cargo of a Bronze Age scrap metal dealer and were probably going to be recast into tools! The site where they were found is protected under the 1973 Wrecks Act. Other Bronze Age artefacts include a priceless gold cup that was found in 2001 in a farmer’s field. 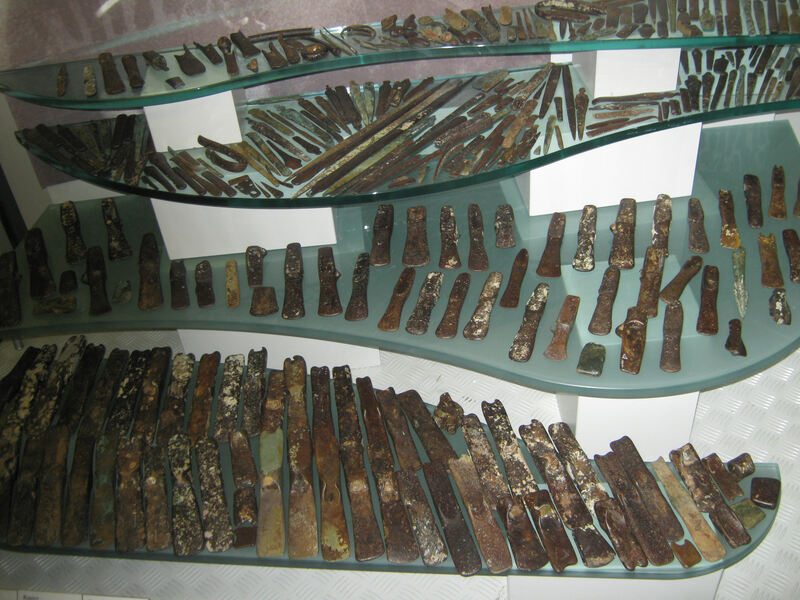 From all this evidence and from the later Iron Age (700BC- 43AD), has led to the conclusion that cross-Channel sea going vessels were operating throughout that time Further, the Iron Age is characterised by the introduction and spread of iron tools and weapons from the Continent. Dover, throughout that time was economically closely tied to northern France, especially the French port of Wissant. 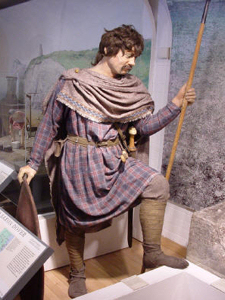 Although, it is thought that the Celts, who were highly skilled craftsmen, may have inhabited the Dover area, it is known that with the expansion of the Roman Empire there was an immigration of Belgics, from north-west mainland Europe. The Belgics were skilled craftsmen and formed large settlements including one near Court Wood, between Dover and Capel. Of interest, when the new A20 was being built in that area, archaeologists found a considerable quantity of related materials. All of which has led to the opinion that Dover had a thriving boat building industry in those early years. The Romans arrived on British shores in 55BC, in a fleet of galleys headed by Julius Caesar (circa 100BC-44BC). Caesar considered Dover was the best place to land as it was perceived as the only sheltered haven on the south-east coast close to the Continent. However, the resident Britons did not agree and quickly made their presence felt. So the Romans turned east and landed at Walmer. Albeit, in the summer of 43AD, Claudius Caesar (10BC-54AD) ordered the invasion of Briton for the Roman Empire. This force again arrived in Roman galleys and consisted of approximately 40,000 troops, under General Aulus Plautius (44BC-01AD). They landed at Richborough, near present day Sandwich, where they established a bridgehead. 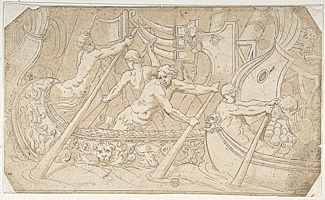 The Roman galleys were, in essence, large rowed boats with a sail for favourable winds. They were light but strongly built and steered by a steer board – or starboard – suspended from the right-hand side of the ship close to the stern. Some galleys had two steer boards one deeper then the other and each was controlled by a small tiller that rotated the steer board in the direction required. When the ship heeled to port, the deeper steer board was more effective but harder to handle than its counterpart. On the aft part of the deck was a cabin surrounded by a substantial bulwark. Upon engaging the enemy the galley fleet formed lines abreast to give each other protection while confronting the enemy from their bows. Each ship was equipped with rams, grappling irons and missile-hurling devices for this purpose. Excavations and research has shown that General Plautius became the first governor (43 to 47AD) of Britain. It was during this period that a fortified ‘castle’ with towers and earthworks was built on the western side of the Dour estuary with quays along the riverbank. Across the estuary, a seawall was built in a straight line between the two-free standing Pharos or lighthouses and in the centre was the harbour entrance. The Pharos were built from blocks of tufa, a form of limestone formed by the shells of minute fish accumulating around a nucleus, such as flint. The tufa used at the times of the Romans almost certainly came from the bed of the Dour as it has been found in many places along the Dour valley. Most notably in St Andrew’s Churchyard – Buckland, London Road, Barton Road and the Peter Street area. The Roman Pharos (lighthouse) on the Eastern Heights, some 43-feet (13-metres) in height, is the oldest surviving building in Britain and can be seen in the grounds of Dover Castle. A corresponding Pharos on the Western Heights was also built not long after the Romans built their harbour. Once the military base and harbour were established, merchant sailing ships started to arrive. These were up to about 100feet in length with a broad beam to provide cargo capacity. Occasionally the crew rowed but on the whole, they relied on loose-footed square sails that were rigged in a fashion that was to be retained for over a thousand years. 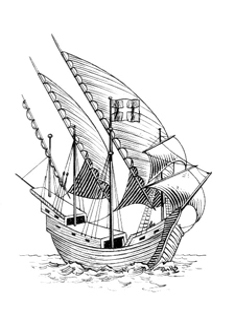 Some galleons were fitted with an artemon, a form of bowsprit on which was set a yard and a square sail of particular use when the wind was astern. At the waterline the hull was about the same at each end and the upper part of the hull was strengthened by external wales (planks of wood), which ran from stem to stern. The stern post often featured a swan looking aft, while both military and mercantile ships were given names often after Roman Gods. It has been shown that the River Dover was tidal and navigable as far as Charlton Green, one-mile inland, when the Romans built the Classis Britannica, in about 130AD. This was confirmed by Kent Archaeological Research Unit (KARU) under the direction of Brian Philp in the 1970s, who found buildings that made up the Classis Britannica Fort. 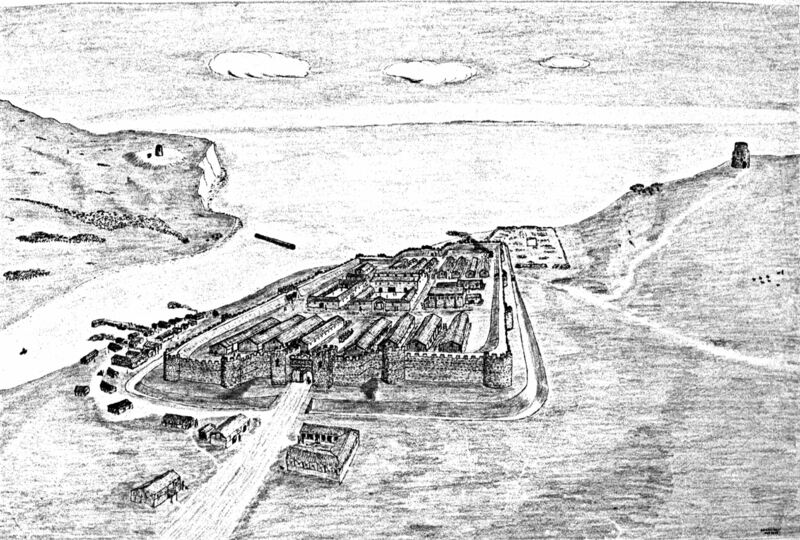 The Fort was effectively the headquarters of the Roman Fleet. It has been conjectured that during this time, due to earth being washed down the valley by the Dour meeting the shingle washed into the estuary by the sea, a shingle bank formed. For this reason, the Romans moved their harbour eastward reclaiming the site behind the shingle bar. This accounts for where the Roman Quay was found by Edward Knocker (1804-1884), in the mid-19th century. Over the course of 500years of Roman occupation, both galleys and merchant ships were built in the vicinity of Dover. As Dover was a major Roman naval base, for a long time this was probably undertaken by skilled Roman shipbuilders brought from Italy. Archaeological investigations undertaken at Portus near Rome have found inscriptions indicating the existence of a ‘guild of shipbuilders‘ during the time of Emperor Hadrian (AD117 to 138). There is little doubt that locals adopted these skills for their own maritime needs especially fishing and mercantile activities. Later in their occupation, the Romans built a larger fort, believed to be a part of the Roman Shore forts erected around 270AD along the coast. These were part of defensive measures against increasing Saxon incursions and by this time locals had refined their skills as shipbuilders. As rulers, the Saxons (c450-1066) followed the Romans and in 596AD, Augustine, a Benedictine Monk, arrived in Kent introducing the Christian religion. A year later he became the first Archbishop of Canterbury, converted Æthelberht King of Kent (560-616) and soon after the King’s son, Eabald (616-640), founded a college for a group of Secular Canons in Dover ‘castle’. The castle referred to at this time is believed to be the former Roman Shore fort. In 691AD, Wihtred (c.690-725), King of Kent, following a victory in battle that was attributed to St Martin, ordered a new monastery to be built in the Saint’s honour. This was for the Canons at Dofras – the early Saxon name for Dover – and St Martin was pronounced the patron saint of Dover. Materials for the new monastery were brought in by Dover built ships, being unloaded on quays on the west side of the Dour. Following the Bapchild Royal Council of 697AD, the Dover Canons were endowed with grants of large tracts of land – including sites along the Dour at Buckland and Charlton. They were also given the lucrative tithe of the passage of the Port of Dover and Dover shipyards flourished under the protection of the Canons. Albeit, while the new monastery was being built the town was frequently the target of attack from sea marauders. To help combat them, King Wihtred ordered the building of a seawall across the seaward face of the delta. Inland, a lane evolved that lead from the centre of town along the harbour to the Eastern Heights and the Roman Pharos. Because of its proximity to the harbour and the mooring posts on the quays, the lane became known as Dolphin Lane. Branching off Dolphin Lane towards the sea, west of the harbour, was St James Lane. From about 790AD Vikings from Scandinavia frequently raided the British and French shores, along with many other places, in their warships. In Northern France, having been given the feudal overlordship of the Duchy of Normandy in 1066 they were to have a major influence in English history. The Viking ships were some 70feet in length, narrow with a shallow draft, light and built for speed. Both ends of the hull were the same shape, which enabled the ships to reverse direction quickly without having to turn around. They were built of unseasoned oak and used the Scandinavian clinker technique in building the hull. With the clinker method, the wooden planks were fixed to each other with a slight overlap that had been bevelled for a tight fit. The planks the Vikings used were split or rived, to make them stronger than if sawn. This enabled the hull to be relatively thin – reported as being about 1 inch thick, and the ship’s wooden ribs maintained the shape of the boat. This meant that the ships, which sat low in the water, were both light and manoeuvrable making excellent raiding machines. The keel was made out of oak planking with each piece riveted together with wrought iron rivets and was part of both the stern and stem. As time passed, this was topped with a highly decorated stern post that was above the gunwale – the upper edge or planking of the side of the ship. The stem post at the bow, an extension of the keel, was even more decorated than the stern post and topped with a large finely carved animal’s head. The Viking ships had oars with a long shaft, or loom almost the full length of the ship, with a flat blade on the end. Initially, while the oarsmen rowed, the oars were held in place with rowlocks. Rowlocks were later replaced by oar ports that allowed the oars to be stored while under sail. A large rectangular sail was hoisted on a single stout mast and the vessels were steered with a large oar over the starboard quarter. Larger ships could travel at five to six knots and up to ten knots under sail. They could carry up to 100 warriors and along the beam the warriors hung their brightly coloured shields. A replica of a late 9th century Viking ship can be seen on the cliff top at Pegwell Bay, Ramsgate. This is the Hugin, which sailed from Denmark to Thanet in 1949, and was given as a gift from the Danish Government. This was in celebration of the 1500th anniversary of the legendary invasion of Britain by brothers Hengist and Horsa, who landed at nearby Ebbsfleet in the 5th century. 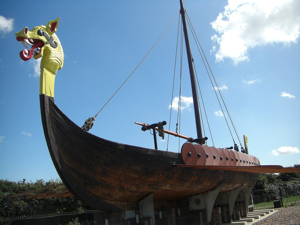 The Hugin is a reconstructed replica of the Gokstad ship, circa 890, that was found in a burial mound at Gokstad in Sandar, Sandefjord, Vestfold, Norway. It is currently on display at the Viking Ship Museum in Oslo, Norway. 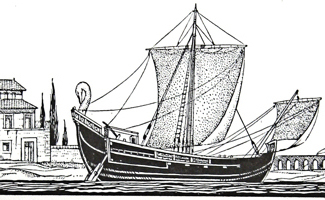 Vikings introduced more sophisticated shipbuilding and endogenous shipbuilders such as those of Dover copied this. 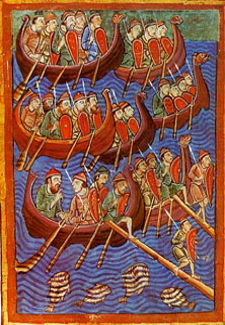 It is documented that Alfred the Great (849- 899) had a number of ships built, based on the Viking design, each of at least 60 oars. These were used, ironically, to counter the Viking raids and later historians regarded Alfred’s fleet as the foundation of the Royal Navy. 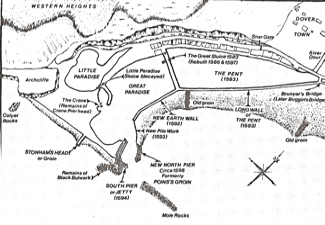 The fleet won a significant victory in the Battle of Stourmouth at Plucks Gutter along the Wantsum Channel, not far from Pegwell Bay in 855. Following Alfred’s death, the ‘Royal Navy’ was abandoned and maritime skirmishes from potential invaders tended to be dealt with on a local level. A significant number of those who took part in the Battle of Stourmouth were members of Dover’s Fellowship of the Passage. The Fellowship of the Passage comprised entirely of Dover Freemen, which came about when the Kings of Kent ruled. As the town developed, the male inhabitants who had acquired personal property were obliged to pay a share of the town’s rent to the king and also to undertake the call to arms. Albeit, they were classed as Free Men and soon this was corrupted into ‘Freemen’. Research historians and archaeologists tell us that during the Saxon period the Dour narrowed and divided into two fast flowing branches. These were named East Brook – later Eastbrook, and the West Brook – later Westbrook. The Westbrook was the main outlet to the sea for the Dour and it was along this branch that the town’s quays were situated. Between the two branches there was a delta of dry land and it was here that the burgesses of Dover developed the town’s shipyard. Evidence from ancient seals and documents show that the design of these ships were based on what was perceived with the tools and resources available and the seas they had to traverse and on both Roman and Viking ships. The early Dover ships had the Roman carvel hulls, that is each wooden plank butts its neighbour. Unseasoned oak was used and the joints were still caulked using seaweed mixed with a binding agent. As the wood was unseasoned it is reasonable to expect that the ships had to be kept at sea all the time as berthing them on land would allow the timbers to dry out and shrink, which would cause the hull to become unstable. The actual design of the Dover ships was based on the Viking ships with a number of significant exceptions. For instance, the hulls were deeper in order to carry cargo and on both the bow and stern were storage cabins. The large sails were rectangular and that that the single large steering oar or sweep situated at the stern of the ship was on the port side. They also appear to lack the decoration seen on Viking war ships. From the documents of that time it would seem that the crew consisted of twenty men and the ships were propelled by oars. They had the large square sail on a central mast that was at its best when the wind was astern. They were steered with leeboard that was shaped like a large flat hook. As Dover ships were built for fishing and transporting people, their horses and goods across the Channel and up and down both the Channel and the North Sea, hence the storage cabins. The prime use of the ships was fishing for herrings, as this was the principal trade of the town at that time. Herring was one of the country’s main staple foods and to enable unloading of the fish a small harbour was established at the mouth of the Eastbrook. On being landed the local women would slit open the herrings and then dry them on specially constructed hangers along the seafront. These hangers were also used in rope making. When the fish had dried out, they were packed into barrels in layers alternated with salt for transportation by the Dover ships. The salt was collected from salt pans created at the side of the Eastbrook. As cargo vessels, the Dover ships were also involved in the trade of luxury goods as far north as the Baltic and south to the western Mediterranean and North Africa. By 1000AD, Dover was known as Doferem and had a thriving municipal boatyard, strong Continental trading links and an established mint. Freemen ruled the town and over time the Dover Freemen amalgamated with those from Hastings, Romney, Hythe and Sandwich and later Rye and Winchelsea, to form the Confederation of the Cinque Ports. The Confederation received a Charter from Edward the Confessor (1042-1066), which gave them rights including freedom of movement, freehold of property, free to run a business and take apprentices for seven years, such that the convention of Dover Freemen was born. By the time of the Conquest (1066), just under half the adult males in the town were Freemen and that ratio would not change for over 600 years. Non-freemen were described as foreigners and had few rights while Freemanship could only be obtained by birth, marriage, apprenticeship, purchasing a freehold and by redemption – an expensive gift to the town. Edward the Confessor gave these rights as he was particularly interested in the Cinque Ports ships and the Portsmen. In return for the rights, by decree, the Cinque Ports Towns were obliged to provided the ruler of the Kingdom with a Royal Navy that centred on the provision of ‘ship service’. That was the provision of ships and men for 15 days a year to defend the realm. By so doing, he put the Cinque Ports above all other towns in the realm. In order to be called on for defensive purposes the Cinque Ports ships were fitted with three ‘castles’ or raised platforms to accommodate the king’s soldiers. These were at the front, fitted on top of the existing storage cabin and called the forecastle that was later abbreviated to focsle, a term still used today. One at the stern again fitted on to the top of the existing storage cabin and called the stern castle and a lower one fitted directly on to the deck around the mast. The Cinque Ports shipbuilders also gave the bow stem a razor sharp edge. When encountering the enemy, the soldiers would fight from the castles in a similar way to that on dry land, while the Cinque Ports mariners would use the razor-sharp bows to strike the enemy ship amidships to sink the opposing ship. Following the fracas, the opposing ship would be left to sink and those on board, drown. 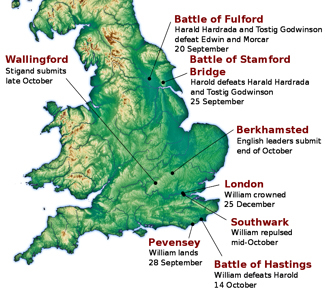 Prior to the Battle of Hastings on 14 October 1066, King Harold II (1066) of England, had been defending the country from invasion by his brothers, Tostig Godwinson c1026-1066) – Earl of Northumbria, and Harold Hardrada (c.1015-1066) – King of Norway and known as Harald III (1046-1066). Both were killed by Harold’s forces on 25 September, at the Battle of Stamford Bridge, East Yorkshire. To meet his foes Harold had taken his army and the Cinque Ports fleet north but while he was away the Viking descendent, William of Normandy (1028-1087), took the opportunity to invade. The winds were in William’s favour and his ships and army landed just outside the Cinque Ports town of Hastings. On hearing the news, Harold marched his army southwards having issued an order for the Cinque Ports ships to take on William’s invasion force. However, the winds that had helped William’s ships were against those from the Cinque Ports and the men had a struggle to row southwards. Hence, they did not arrive until after William’s forces had landed and Harold was killed and his tired army soundly beaten. Following the Norman Conquest, the Cinque Ports, in 1069, were called upon to prove their loyalty to William I (1066-1087). They prepared their ships for battle and with a full retinue of soldiers they sailed to meet the King’s enemy. However, due to the direction of the wind they were unable to use their favoured method of attack and William expected that they would give up. This, the King assumed, was confirmed when the Cinque Ports mariners steered to windward of the enemy fleet. However, when the enemy ships were downwind, the Cinque Ports mariners heaved-to and threw large quantities of lime that they were carrying, at the enemy. This temporarily blinded the King’s enemy and enabled William’s soldiers to annihilate the opposition. William recognised this as the Cinque Ports showing their loyalty to the monarch, so he granted them all the rights and privileges they had previously enjoyed in return for the established ship service. For Dover, William particularly assured the town’s Burgesses that the harbour would remain the base for the Royal fleet and as in Saxon days when the local ships were used for domestic duties, they used Eastbrook harbour. The much larger Westbrook harbour, with quays alongside what is now St James Lane, was used when the Cinque Ports ships were fitted out for ship service and unloading building material for St Martin-le-Grand monastery and other Norman buildings in the town. To rule his newly acquired country effectively, William created palatinates and the Kent palatinate was under his half-brother, Odo the Bishop of Bayeaux (d1097). Odo, unfortunately, ordered a tidal mill to be built on the seashore close to the mouth of the Westbrook and it is believed that this mill allowed the build-up of silt. This eventually blocked the Westbrook and the entrance to Dover’s main harbour. In consequence the Eastbrook of the Dour increasingly became the main outlet to the sea and the town’s main harbour. 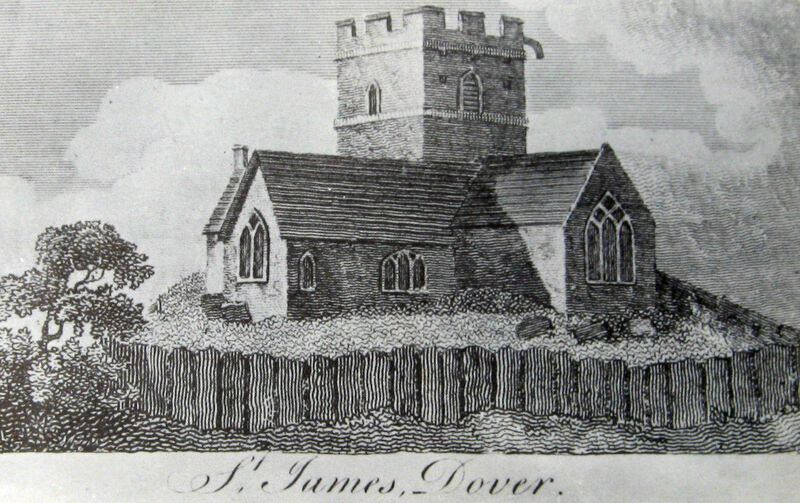 18th Century sketch of the old St James Church, the mariners church from 11th to early 19th century. 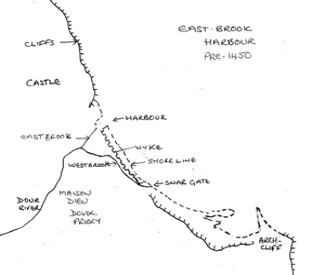 The Eastbrook emptied into the sea near Warden Down – the cliff that Castle Hill Road traverses – and the harbour was approached through Eastern Gate. Around this harbour Dover seafarers had long since settled and to serve their spiritual needs, the mariners St James old Church was built. At this time, the harbour seems to have entailed very little expenditure on the Corporation and the number of shipyards increased with both freemen and non-freemen sons being offered apprenticeships. Once they had served their apprenticeship and proved their skill, the young men were granted freemenships. This not only gave them the right to run their own businesses, train apprentices etc. they could also take an active role in civic affairs. As the shipyards developed, the number of associated trades increased and those with skills gained elsewhere by apprenticeship were awarded with freemanship on payment. A skilled ship’s carpenter’s tools at this time would comprise of a trestle for cutting or splitting planks of oak using double ended saws. The oak planks were refined to meet the shipbuilder’s specifications by using handsaws and tools developed by the individual craftsmen. If the wood was to be shaped, to make it pliable the plank was placed in a long steam box and the water heated to the boiling point – 212degrees Fahrenheit or 100degrees Celsius. Businesses such as blacksmiths, ropemakers, riggers and sailmakers also set up and like the shipbuilders and carpenters, initially they served their apprenticeship, and gained their freedom by hereditary or purchase. Once purchased their freedom became hereditary for their descendants. Cinque Ports ship early 14th century note the rudder. Dover Library. From the increasing availability of top-class products the shipwrights built an increasing quantity of top quality vessels that incorporated new innovations. Typically oak, their favoured wood was seasoned before used. Seasoning involves the drying out of fresh of green wood as this contains about 50% water. By reducing the moisture content the wood adds strength, elasticity and durability properties to the finished ship. Another, later, significant innovation were rudders for steering or directing the ship. They were hung on the stern post, which were straightened for the purpose. By having rudders, the ships no longer required the large, difficult to handle, inefficient steering oar. About 1200AD the sea started to encroach the Dover shipyards area. To protect them and the town, the Corporation assisted by the Lieutenant of the Castle, built a retaining wall. This was from where Snargate and Bench Streets meet today to the west side of Eastbrook and called the Wyke – later renamed the Old Wyke. This had the effect of creating an inlet of the sea and a small cove on the west side of the eastern mouth of the Dour. It was on the margins of this cove that the shipyards reopened and the Wyke along with its maintenance was paid for out of the profits of the Passage and fines on maritime activities imposed by the Lord Warden. When the Wyke was completed, behind it a level, quay was built and for the first time the town had a commodious quayside where passengers and merchandise could embark and disembark. This attracted both merchants and passengers to the port and it became more lucrative for the ship owners to carry them rather than supporting the Crown with ship service. The larger ship owners tended to hold the high positions on the Council and thus volunteered the ships of the smaller businesses for ship service while they monopolised the passenger/merchant services. This led to changes in ship design with new ships being built for the passage, having deeper holds and hulls of better quality wood etc. Those ships used in ship service tended to be repaired older ones and Edward III (1327-1377) attempted to put a stop to the practice. He did this by supporting an agreement whereby all Dover ships had to take it in turns to carry passengers/goods across the Channel. After three such trips, the ship was not allowed to make the crossing until all the other ships in the Dover fleet had undertaken three crossings. Further, all ship owners had to provide ships and crew for ship service by rotation and any ship owner that violated these agreements faced a penalty of one hundred shillings sterling. The town’s bailiff levied this, and the money raised passed into the hands of the Lord Warden, who therefore had a vested interest in assuring the agreement was adhered to. Once this became routine, the Cinque Ports ships and the mariners who sailed them returned to being held in high esteem by the King and the demands for their services by the Crown increased though the payments for using the ships was not forthcoming. This had a negative effect on the town’s economy as the shipbuilders were unable to pay for building or repairing materials. Edward III, totally misunderstanding the situation he was causing, in 1355 authorised the mayors of the Cinque Ports to employ ships’ craftsmen with the necessary skills to help build and repair ships for fighting purposes. However, he still failed to pay for the ships and Dover and the rest of the Cinque Ports shipbuilding industry went into serious decline. Five years later an unstable peace existed that was to last nine years and the Cinque Ports were ordered to use the time to replenish their fleets but no money was provided. During these years the English lost complete control of the Channel and hostilities were then renewed. Richard II (1377-1399) from a window in the Maison Dieu. Alan Sencicle. Due to the lack of ships, the King was forced to pay merchants to use their ships for defensive purposes. Albeit, he failed to pay the mariners for sailing the ships along with his soldiers. This not only resulted in increasing anger but the lack of ships and soldiers based at the Castle to defend the Cinque Ports gave the French the opportunity to take advantage of the situation. 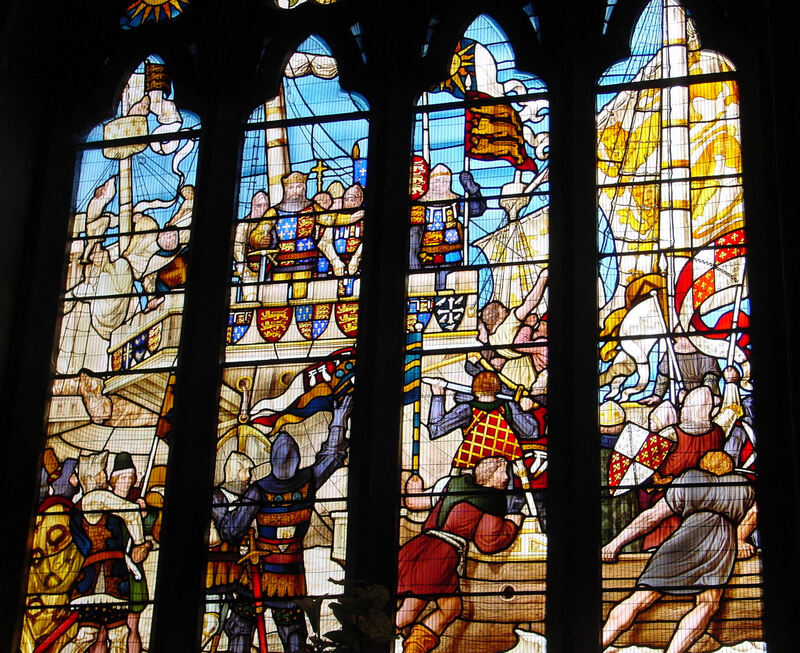 This happened within a week of Edward dying on 21 July 1377. The French attacked the undefended Hastings and Rye and also appeared off Dover but did not attack. Instead, they sailed east then north entering the Thames and burnt Gravesend. His 10-year-old son, Richard II (1377-1399), succeeded Edward III and the war with France was resumed. Pressure was put on the young King to pay his soldiers, mariners, shipbuilders’ etc. and a poll tax, at four pence a head from all lay people over 14, was introduced. This led to the Peasants’ Revolt in 1381 whose leader, Wat Tyler (d1381), came from maritime Kent. During the stand off, promises were made but when the revolt was crushed all the concessions were revoked. In order to try and build up a maritime defence, Parliament called upon all inland towns as well as ports, to build ships but due to the chronic lack of finance the Cinque Ports were unable to meet the demand. To stave off starvation, the towns were using their only seaworthy vessels to carry wool to Flanders, the major purchaser of English wool. In 1382 a writ was issued for Dover to press shipbuilders and associated tradesmen to work in the industry but by then Flanders had fallen under the influence of France so demand for exports had dried up. From Dover, the mariners were using their ageing, war battered ships, for piracy and Richard II, although recognising the cause of the problem did not have the financial resources to draw on. 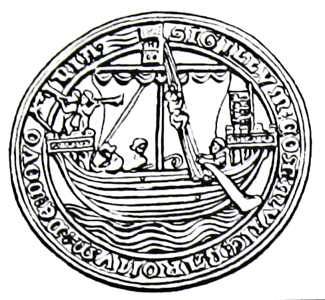 Instead, he issued a Charter in 1381 that stated, ‘no pilgrim shall pass out of our realm to Foreign parts except from Dover under the penalty of imprisonment for one year.’ This started to help Dover’s declining economy and two years later an expedition was mounted with the aim of opening the Flemish markets to the wool trade. The French were not interested in England’s wool and local mariners returned to piracy when not transporting pilgrims across the Channel. Together, these did increase the demand for the classic ships and classic Cinque Ports ships were produced. In October 1396, Richard II landed at Dover with his second wife, Isabella of Valois (1389-1409), a child of eight years of age. Two years after the murder of Richard II she was reconveyed to France from the town by three ‘balyngers’ and two armed barges on 1 July 1402, ‘without her dowry and plundered’. A balynger was a vessel that could be propelled by either oars or sails and the name is supposed to derive from baloena – a whale. John Shute of Dover was the owner and he received £92 6shillings 8pence for his expenses and for bringing back the retinue of lords and ladies who accompanied the widowed Queen. The town was in terminal economic decline and in an attempt to raise revenue to pay for new ships, the Corporation introduced wharfage dues for the use of the Wyke. This included the towns’ mariners and needless to say, this led to an uproar. During the minority of Henry VI (1422-1461), Humphrey of Lancaster, 1st Earl of Gloucester (1390-1447), was both the Lord Warden and the Protector of the Realm and in 1424, in the King’s name, he granted a Charter to the people of Dover free wharfage to their ships forever. This remained on the Dover Harbour Board’s statute book until the twentieth century when they quietly had the privilege revoked. In a Charter of 1440, it stated that ‘the inhabitants of the town have almost entirely left it and half the town is empty and desolate, and its houses have, in many cases, fallen into ruins, will very likely be destroyed, and the inhabitants compelled to leave it, it is said, unless some fitting remedy be provided quickly.’ Henry VI had issued the Charter in order to try and reverse this situation by encouraging ship building saying, ‘the construction of ships for the passage, so that they might be trustworthy, strong, and good, as well in timber as in workmanship, also in ironwork and in all other things that shall appear requisite and fitting for strength and security.’ However, due to the lack of finance to undertake shipbuilding Dover could not afford to build any ships. Hythe and Sandwich could and in consequence increased their production and poached all the cross-Channel traffic from Dover, leaving the town destitute. Further, the Eastward Drift – a phenomenon caused by the tide sweeping round Shakespeare Cliff and depositing masses of pebbles at the eastern end of the bay, was causing significant financial problems, as the pebbles had to be constantly removed from the entrance to Eastbrook Harbour. Then when the town thought that matters could get no worse, there was a major cliff fall from the Eastern Heights, blocking the harbour and rendering the Eastbrook harbour useless and causing serious flooding. Consideration was given to abandoning the town, as there were only a few inhabitants and the religious houses remaining. The remaining mariners moved their ships to a sheltered area at the western end of the bay where Archcliffe jutted out. This gave just enough protection from storms and from there they earned a living fishing. Around 1495, Sir John Clark, Master of the Maison Dieu, on successfully seeking Henry VII’s (1485-1509) patronage, designed and constructed a jetty near the mariners’ cove. Known as Clark’s Jetty it had towers for ships to be moored, one of which was Wyke tower. This sheltered the cove from the Channel seas and was such an improvement that the mariners called it Paradise Pent – later Little Paradise. Ship repairing and building started up again on the seafront near to what had been Eastbrook harbour. The ships that they produced were small sloop rigged craft of about 40-tons. 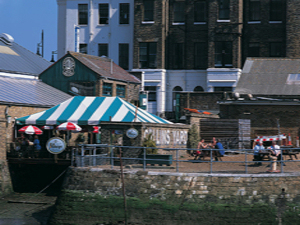 The mariners quarter on reclaimed land at the western side of the Bay, had become known as the Pier District after a pier built by Henry VIII (1509-1547). This area grew significantly following harbour works carried out by Thomas Digges (c1546-1595), of Wooton during the reign of Elizabeth I (1558-1693). Snargate Street, named after the medieval Snar Gate believed to have been built in 1370, was almost the only access to the area from the rest of Dover. During this time innovations were taking place in shipbuilding which had passed Dover by. These included the development of caravels, small highly manoeuvrable ships, by the Portuguese for exploration of the African coast. They had gently sloping bows and single stern castles, two masts and on the mizzenmast lateen sails could bet set for speed, particularly when sailing to windward. Lateen sails were triangular with a long yard held at an angle of 45° to the mizzenmast. The other major innovation in shipbuilding was the carrack. This was a much larger three or four-masted ocean-going sailing vessel of up to a 1,000tons with significant cargo space for long journeys and enabling it to carry large payloads. 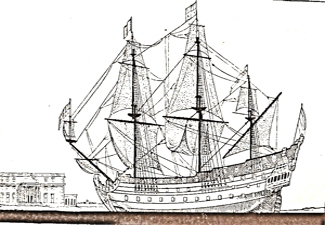 The carrack initially had one large sail, as shown in the picture, but as the 16th century progressed the number of square sails were increased to provide a much larger sail area. They were hung above the courses on the mainmast and foremast. The mizzenmast was rigged with a fore-and-aft triangular lateen sail and sometimes a square sail was hung beneath the bowsprit forward of the bow. They had high stern castles and an even higher fore castle thrusting out over the bow. These ships required a large crew to handle them and they were usually armed with cannons. Thomas Digges had utilised the physical changes occurring in the Dover Bay, enclosing a large area into which the Dour flowed. This was named as the Great Standing Water or Great Paradise Pent. A floodgate and sluice were inserted in the embankment that is now Union Street. This enabled the Great Paradise Pent to empty into Paradise Pent and clear any shingle blocking the harbour gates. To protect the town during periods of heavy rain that caused flooding, a sea wall was built. Work began on 13 May 1583 and was finished about 1586, at a cost of £7,495, becoming the foundation for the Western Docks. To pay for the works Elizabeth I (1558-1603) in 1579 granted Dover the right of ‘Passing Tolls’ – a tax that was initially 3d (1.25p) per ton, was paid by all ships passing through the Strait of Dover. The Passing Tolls Acts were to be renewed many times over the next 400 years and the money collected was only used for harbour repairs. 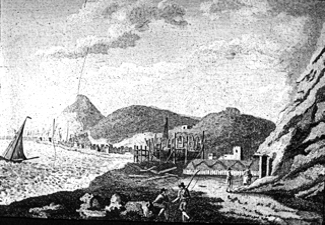 On completion of Digges harbour, the shipbuilders moved to the Pier District beach by the seawall and supporting industries such as blacksmiths and sailmakers were set up nearby. As an ancient industry, the town’s Ropewalk was further east near the back of present day Gateway flats. Nationally, the large carracks dominated shipbuilding and these were used both as warships and merchant ships in the same way as the earlier Cinque Ports ships. To build and repair them large shipyards, under the patronage of the Crown opened. These were Portsmouth (founded 1496) Woolwich (founded 1513) and Chatham (founded 1547). Also, on the River Thames, the East India Company (founded 31 December 1600) opened a large shipyard at Blackwall. In Dover, the shipbuilders built fishing boats for their own/family use and incorporated aspects of both carracks and the Portuguese caravels for small sloop rigged craft of about 40-tons, as passage ships. One of the locals who set up a shipyard at this time was Dover Freeman, Edward Kempe (1563-1612). He may have been the son of Thomas Kempe of Dover and therefore christened on 4 April 1563, and if it was, he gained his Freedom by hereditary. In 1588, at the time of the Spanish Armada, John Tench (d1589) was the Mayor of Dover but then died the following year. Mayor Tench had married Alice, daughter of Thomas Legent who was well known as a formidable lady that successfully organised many of the town’s civic functions as well as her husband’s political career. 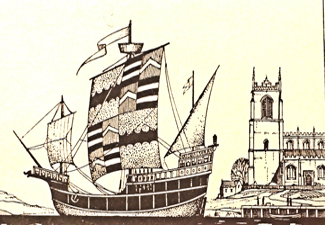 On the death of John Tench, Edward courted the widow and on becoming Mrs Kempe, Alice not only successfully organised Edward Kempe’s civic career but also his shipbuilding business. 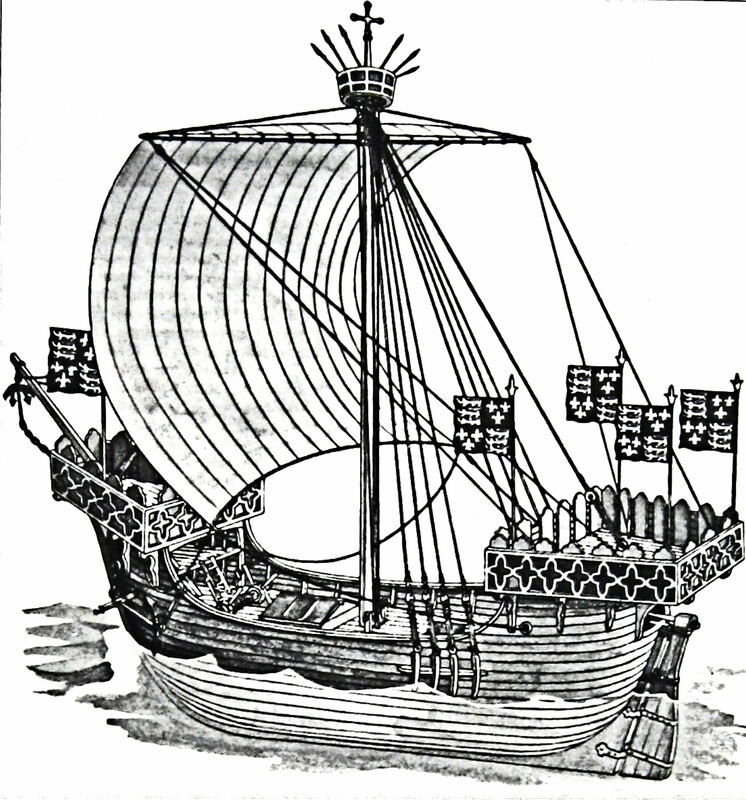 Until Alice came along, Edward Kempe was producing similar ships to those of the neighbouring shipyards, but Alice managed to gain an order to build a galleon. This Kempe built out of seasoned oak and generally followed those produced elsewhere. It was under 500tons and had a square tuck stern. Although the forecastle projected forward, it was smaller than that of a carrack and further back. His galleon incorporated a snout or head, for the crews’ latrines below the level of the forecastle. As typically, the ships had portholes on the gun deck to allow guns to be mounted lower in the hull and not just on the deck, so did Kempe’s. This enabled more powerful guns to be used that would not capsize the ship when fired. On the successful production of this prototype, orders came in and each subsequent ship became increasingly streamlined and therefore, faster. During this time, production in Dover started on ships that specialised in taking pacquettes – Royal messages etc. across to the Continent. Couriers, riding fast horses from London would carry the pacquettes and on arrival at the port, the pacquettes would be stowed aboard a passage ship that would leave Dover or the French port on the following high tide. The ships that carried the despatches became known as pacquette boats and finally packets. 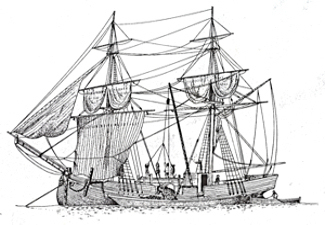 For this purpose Kempe and other Dover shipyards built ships with features more akin to the Portuguese caravels than galleons, with such features as a lateen sail. By 1624, there was a well-organised Dover packet service to and from Wissant, Calais, Boulogne and Dieppe and a timetable had been introduced to attract the travelling public. For the owners of the packet ships, this quickly became a lucrative business, for although they were fined if the despatches arrived late, they received a regular premium to operate the service and they charged the travelling public high fares. Further, the ships were cheaper to build and therefore to buy and they required considerably less crew than the galleons. The port of Dover had effectively developed into a ‘Freeport’, where goods were stored for trans-shipment in large warehouses that lined the seaside of the harbour and owned by the Braemes and Hammond families, amongst others. These goods were usually deposited by ships from the Continent and temporarily stored until they were picked up by ships going further afield, or visa-versa for a payment of less than half the duty demanded by regular Governments duties. In 1633-34 overseas products reshipped from Dover were at least twice as many as English products exported. C.W. Chalkin, in his book Seventeenth Century Kent: A Social And Economic History, tells us that in 1629 Dover had the largest volume of shipping in Kent, with thirty-six vessels totalling 2,063 tons. Dover shipbuilders had met the spin-off from the trans-shipment trade by producing galleons that were wider on the beam and deeper draft in order to carry merchandise across-Channel. For travellers, although slower than packet ships and dependent on adequate amounts of cargo before setting off, passage ships – as the cargo carrying galleons were referred to, offered cheaper fares. This highlighted what had become a national issue, as the cost of travelling on packets had become exorbitant. Further, official despatches frequently went missing so James I (1603-1625) appointed Matthew de Quester as the government’s postmaster. Officially, his job was to supervise the carriage of letters ‘to foreign parts out of the monarch’s domains between Dover to the Continent.’ However, Quester made little difference to the service other than effectively introducing a tax – which he may well have pocketed – on merchant’s communiqués. Both merchants and the packet travelling public complained and in March 1633 Thomas Witherings (d1651) was appointed the official postmaster. He organised a system whereby the packets carried the mails to Calais immediately on their arrival at Dover but nothing else. As they were no longer carrying passengers, the timetable was abolished and the packet ships had to wait in France for the despatches to arrive before being brought back to England. The service ran twice weekly boats to Calais, and there was also a French sailing. At other times, the shipowners used the packet ships to carry the more lucrative timetabled passenger trade. In 1639 another shipbuilding family opened a shipbuilding business alongside the Kempe shipyard in the Snargate Street area. This was run by members of the extensive Cullen/Cullin family and their legacy can still be seen today in Cullins Yard Seafood restaurant on Cambridge Road. The Cullen family were freehold owners at Great Napchester in Whitfield and quite wealthy. Indeed, Juliana Harvey (born c1576) half-sister of Dr William Harvey (1578-1657), physician to James I and famous for his discovery of the circulation of blood within the body, married a Thomas Cullen of Dover. It is also recorded in a Dover Corporation minute of 14 November 1636 that the premises in Biggin Gate was granted to James Cullen the Master of the Company of Dover leather workers for 21 years for their meeting on all occasions. However, it was brothers Thomas (b1616) and William Cullen (1623 –1678) that went into shipbuilding. Luke Pepper, the Master of Dover’s Almshouses, in 1634 was the Mayor of Dover when Charles I (1625-1649) demanded ship money off every local authority in the country. Although the country was not at war, the Royal Navy was in poor state and the Royal shipyards did not have the money to build any new ships. Dover shipbuilders were angry as they were expected to subsidise their rival manufacturers. Nonetheless, the King’s writ stated that all authorities, ‘had to provide a ship of a certain tonnage, armed with a certain number of guns, equipped with a specific crew, supplied with provisions for six months and to be ready for service of the King at a certain sea-port on a set day.’ The cost of each ship as described in the writ was estimated at an average of £10 per ton and if the authority could not provide the said ship then they had to pay an equivalent tax. It was estimated that the tax would raise about £10million. It was the duty of the Sheriff of each county to undertake the assessment of the authorities in their jurisdiction and the Cinque Ports were rated at one ship of 800-tons with 320 men. On this basis, Dover was expected to pay £330 per year from 1635 and for the following four years, with a 20% discount if paid promptly. The first demand for the annual ship money in Kent, was instigated by John Finch, 1st Baron Finch of Fordwich (1584-1660), in 1635. Four years later Dover, along with the rest of Kent, had not paid it or any subsequent demands. The county, in retaliation, was accused of ‘having a sad lack of religion, being sympathetic to Catholics, and a large number of rogues and ale houses.’ Following this, the Cinque Ports were ordered to provide both ship money and 300 soldiers with their clothing and other disbursements or pay £3 per man. The Ports petitioned Parliament saying that they could not afford to pay but by the time the complaint was to be heard, Parliament had been dissolved. By the outbreak of the Civil War (1642-1651) the Cullen shipyard was producing collier brigs used for carrying coal from the northeast to Kent. They were two masted, between 100-300ton and built to a standard design with square sails and fore and aft staysails. In 1641 Thomas Cullen was elected the Mayor of Dover and was holding the position at the time the Civil War broke out. Like most in the town, he was inclined towards the Parliamentarians but that summer shiploads of horses and men arrived for Charles I’s army, from the Continent. Alarmed, on the night of 20-21 August, local man, Richard Dawkes (b1606) together with 30 men scaled the Castle walls and disarmed the sleeping guards. Surrounding the porter’s lodge, they banged on the door until the guard opened it and surrendered the keys. They then locked the Castle gates, collected the ammunition and sent word to the town for reinforcements. The Parliamentary leaders fearing that Irish Catholic troops would join the Royalist army requested the aid of the Scots. The Scottish Presbyterian Covenanters promised their aid in return for the Scottish system of church government to be adopted in England. This was accepted by the majority of what became known as the Long Parliament, formed 1640 and continuing until 1653. In consequence, The Solemn League and Covenant was drawn up. This was effectively a treaty between the English Parliament and its Scottish counterpart for the preservation of the reformed religion in Scotland and the reformation of religion in England and Ireland. Although it did not explicitly mention Presbyterianism it was this group of Protestants it was aimed at. Nonetheless, it gave the green light to the English Independents – another form of Protestantism. The Cullen’s were English Independents and in 1651 William Cullen was elected Mayor. This was the first of four times he was to hold the office during the Commonwealth (1652-1660), which was introduced by Oliver Cromwell (1599-1658). He ruled the country and during his administration four parliamentary elections were held in Dover. Cromwell dissolved the Long Parliament on 16 December 1653, and introduced by ‘an instrument of Government’ … to the end that the kingdom might be more equally represented.’ This gave England and Wales 395 Members of Parliament – 262 in the counties and 133 in the cities and towns. Dover, like most other towns was allowed to send one representative to Parliament, and in the election of 1654-1656, this was William Cullen. Albeit, already, Mayor Cullen had been involved in national issues, for instance in October 1651, following Cromwell’s introduction of the Act of Navigation. Under this Act, any goods imported into England or transferred from one English colony to another, had to be carried in English ships. This meant that goods carried on Dutch ships was not allowed into any of the English colonies without paying hefty customs duties. As the legal statutes that gave Dover Freeport status, the new Act demanded that Dutch ships were obliged to deposit such goods at Dover for transferring onto English ships. To ensure that the Act was adhered to, English customs had the right to intercept non-English ships passing through the Strait of Dover and confiscate any unlawfully exported goods and the ship. 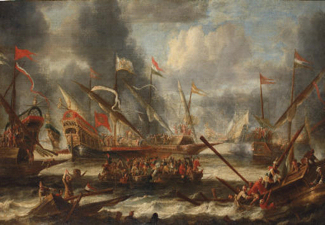 On 19 May 1652, the Dutch Admiral Maarten Harpertszoon Tromp (1598 –1653) was leading a convoy of 44 ships along the Downs and he refused to strike, that is, lower his flag in acknowledgement of the English fleet. The fleet was headed by Admiral Robert Blake (1598–1657) who had some fifteen vessels under his command. In response, Blake ordered a shot to be fired across Tromp’s bows to which Tromp retaliated with a broadside and a fierce battle began. Mayor Cullen arranged for townsmen to take their ships and help the English. Subsequently the Battle of Dover ensued until the Dutch fleet retired towards Holland. Blake reported what happened to Cromwell and in response, the Council of State wrote to Mayor Cullen wrote that, ‘The men of the Toune who so cheerfully went forth to assist in defence of their country which good seruice of theirs’. They also directed that the Dover men who had participated should be rewarded out of the prizes taken by the English fleet while the town was promised finance to build a new harbour pier. Following the defeat of the Royalists at the Battle of Worcester in 1651, the Scottish Presbyterians ceased to have a strong influence in England and the various Protestant fractions that made up the English Independents were strengthened. What was happening to the Cullen shipyard during this time is unknown, but religion and politics were synonymous. In 1654, Mayor Cullen ordered the Royal Arms to be taken down from the front of the Dover Court Hall and replaced by the Arms of the Commonwealth. Charles II landing at Dover 25 May 1660 window. Stone Hall in the Maison Dieu. Oliver Cromwell died in 1658 and in February 1660, the Long Parliament reconvened. After issuing a call for the election of a new Parliament, it dissolved itself and on 25 May 1660 Charles II (1660-1685) landed on Dover beach. He had travelled from the Continent on the Royal Naval ship the Naseby, captained by Dovorian William Stokes (1624-1691) and the monarchy was restored. Although Dover welcomed Charles II, the religious sympathies of the town were still that of English Independents. So, when the King asked for his Royal Arms to be erected in St Mary’s Church, he was forced to make his request statutory before townsfolk complied. Following the Restoration (1660), Stokes, returned to Dover and worked his own ships. Initially, these were built by the Cullen shipyard with a design based on an adaptation of the warships such as the Naseby with similarities to the ships produced by the Kempe ships of the beginning of the century. Stokes was a member of the Church of England, or Anglican as it was generally termed at this time, and Charles II only accepted Anglicanism. Other forms of English Protestantism as well as Catholics were not tolerated. In 1662 the King’s Commissioners ordered all Dover officials to be Anglicans and therefore Stokes retained his civic position and became one of the most influential person in the town and was elected Mayor on seven occasions. The Cullens, on the other hand, lost their political positions and their shipbuilding business suffered and closed. Further, although Passing Tolls on which the town relied to pay for harbour repairs had been reintroduced following the Restoration (1660), these were considerably less than prior to the Civil Wars. Finally, when the Act expired in 1670 it was not renewed and so the harbour, already in a poor state, was left to the mercy of the wind and the weather. Nicholas Cullen (b1655), was possibly a nephew of Thomas and William and was keen on shipbuilding. He may well have honed his expertise in Holland for towards the end of the reign of Charles II the Dutch East India Company presented two yachts to the King. The design and how they were built Cullen knew, as they were similar to the crafts that the Dutch used as fleet tenders. The ships given to the King had bluff (rounded) bows, which were carved in royal insignias, they had gilded sterns and the rigging was simple fore-and-aft. So impressed was Charles II that he ordered fourteen more to be built in England. Nicholas Cullen was possibly involved in building one. The traditional Dutch ships were shallow draught vessels and about 80feet long with leeboards. The ships built for Charles II did not have leeboards as these had been discarded in favour of the square topsail. The ships were also more streamlined for speed. Cullen took over the almost neglected family shipyard, but due to the harsh religious persecution of Non-Conformists to the Anglican doctorine, it was the only shipyard in the town. Although keen to learn, most of his workers were religious dissenters, thus subject to overt intimidation. They were not allowed to have businesses on their own account nor had they been allowed to undertake apprenticeship training. Stokes still held political power in the town and although paying lip service to this persecution, he went out of his way to protect Dover’s Non-Conformist citizens. As Cullen started rebuilding the family business he was faced with having to train his workers against the over-riding doctrine. This meant that his business rested on the building of collier brigs and most ship owners wanted them to be built as cheaply as possible. They wanted ‘workhorses’ that could be sold or scrapped at the end of their working life. These Cullen produced and ensured a regular full order book. However, due to the lack of skilled men, when Cullen was approached to build larger better quality ships he was forced to turn the commissions down. 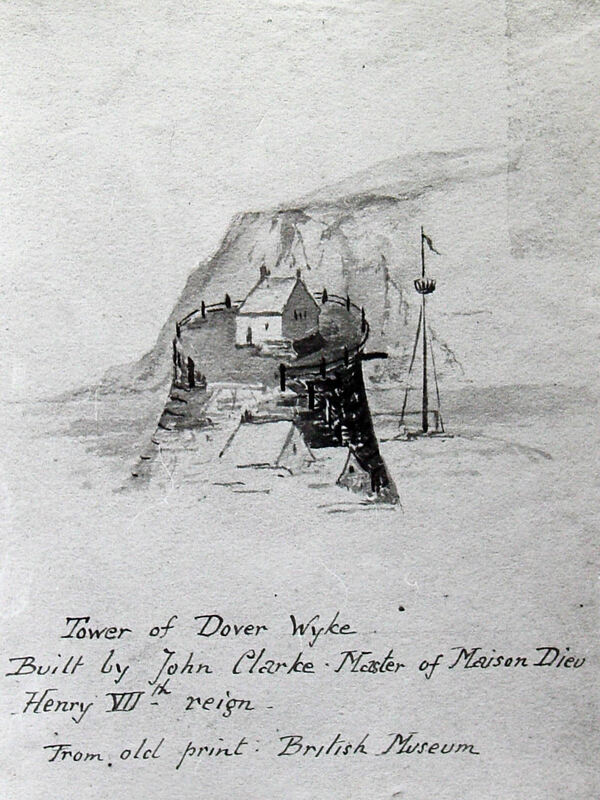 In 1677 a Statute for the Realm a survey was carried out, and the one for the Town and Port of Dover stated that ‘The Mayor was William Stokes and the Councilmen were: Captaine Edward Roberts, John Matson, Richard Jacobs, Walter Braemes, Doctor Stephen Goulder, Edward Wivell (d 1716), William Richards, Nicholas Cullen, John Bullocke, Nathaniel Drew, Richard Breton, Frederick de Vinck, Symon Yorke (d1682), William Stokes, Charles Valey, Francis Basnick, Aeron Wellard snr.’ In April 1679 Stokes was elected as one of the two candidates representing Dover in Parliament. The other was Philip Papillon (1660-1736), of Huguenot stock and therefore attended the Anglican church. Dover’s Clerk of the Passage at this time was ship owner Jurat John Carlisle. In a fit of jealousy, he wrote to the Privy Council and complained that Stokes had condoned secret and unlawful religious meetings of Non-Conformists and added that Papillon’s family background showed him to be a Non-Conformist rather than an Anglican. The Corporation were ordered to close all places where it was believed that Non-Conformist worship was taking place and to arrest six named Dovorians. These were Samuel Taverner (c1621-1715), Richard Matson, Edward Dell (b1599), Nathaniel Barry, Anthony Street and Symon Yorke. Richard Matson was a wealthy ship-owner with large land holdings in East Kent, all of which were confiscated as were all of the other accused men’s possessions. Both Stokes and Papillon were rebuked in Parliament but in 1681, they were both re-elected. Nonetheless, neither attended parliament that had reconvened in Oxford. Although merchants such as the Hammonds and Braemes had refurbished their warehouses and were rebuilding quays around the harbour, as had a Mr Brinder, Dover’s harbour was derelict and the town was in a poor state. Nicholas Cullen was elected Mayor in 1679 and again in 1680, 1681 and 1682 and he invited the Royal Ordnance to make their assessment of the port of Dover. Help was not forthcoming so possibly as an overt act of defiance, Cullen ordered the Mayor’s and Jurats to hold their meetings above the Communion Table in St Mary’s Church. They readily complied and this quickly brought the King’s Privy Council to Dover. Cullen, along with other members of the council, were accused of taking the oath of the Solemn League and Covenant even though it had ceased to have any relevance since 1651 but had been outlawed by the 1661 Sedition Act and this is what they were accused of violating. Nicholas Cullen lost his office as Mayor and was replaced by Stokes. At the same time the town was issued with a new Charter that was aimed at blocking Non-Conformists, or their sympathisers, from holding Office. Stokes, the Anglican councillors and the town in general refused to comply. The town was heavily punished by having to pay hefty fines. In consequence Dover was forced to sell valuable assets including the town’s ancient silver as well as land at knockdown prices. James II (1685-1688) succeeded his brother, Charles II, and was determined to return the country to the Catholic faith. Possibly at this time Nicholas Cullen went abroad, as did Thomas Papillon and many other non-Anglican Dovorians. Albeit, Dover’s Mayor at the time the King ascended the throne was a Huguenot Robert Jacob. He was selected again in 1688, but was removed from office by the King’s Privy Council. By the middle of 1688, James II’s days were numbered and plans were afoot for William of Orange (1650-1702) and his wife Mary Stuart junior (1662-1694) to land at Dover and take over the throne. William’s mother was Mary Stuart senior (1631-1660), the daughter of Charles I, while William’s wife Mary was the daughter of the beleaguered James II. On the day William and Mary were due to arrive, about 300 locals took possession of the Castle and remained there all night. However, due to a strong easterly wind William had continued to sail westward making landfall in Torbay on 5 November. This was followed by the Glorious Revolution (1688) that saw James go into exile and William III (1689-1702) together with his wife Mary II (1689-1694), crowned rulers of England. In St Mary’s church the Royal coat of arms of William and Mary was erected shortly afterwards and can still be seen there. Papillon returned to Dover and with Stokes, they represented the town in Parliament. Because of all the troubles of the previous century the town, and in particular the port, was in a very poor state. Although, it was hoped that this would change following the Glorious Revolution, the country became embroiled in the Nine Years War (1688-1697) between Louis XIV (1643-1715) of France and a European coalition of Austria, the Holy Roman Empire, the Dutch Republic, Spain, England and Savoy. In the Channel, French privateers used the situation to their advantage and during this time England lost roughly 4,000 merchant ships to them. Following the Glorious Revolution, Nicholas Cullen had returned to Dover and reopened the family’s shipyard. He employed both Anglicans and Non-Conformist workers and they were all keen to gain the necessary skills in shipbuilding and associated industries. However, due to the poor state of the harbour, would be buyers were put off. This was cited by the Mayor Edward Wivell (d1716) in 1699, as part of a petition to William III for the renewal of the Passing Tolls Act. Passing Tolls were reintroduced but the average number of foreign cargoes passing through the port between 1695-1697 was only 29 and this low figure was reflected in the amount of revenue earned. It would seem that Cullen showed a prototype of a galleon in the Bay Because due to the poor state of the harbour, and potential buyers were actively sort out. Soon the Cullen shipyard were producing galleons as one off designs following a standard pattern and were much larger than the ships previously built in Dover. 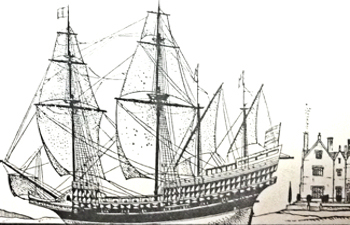 Although the Dover galleons still had a forecastle and poop these were lower than their earlier counterparts, the bows were more rounded and the hulls were more streamlined. Although the Dover ships artists had suffered during the religious persecutions, painters slowly emerged and expanded their craft into woodcarving. 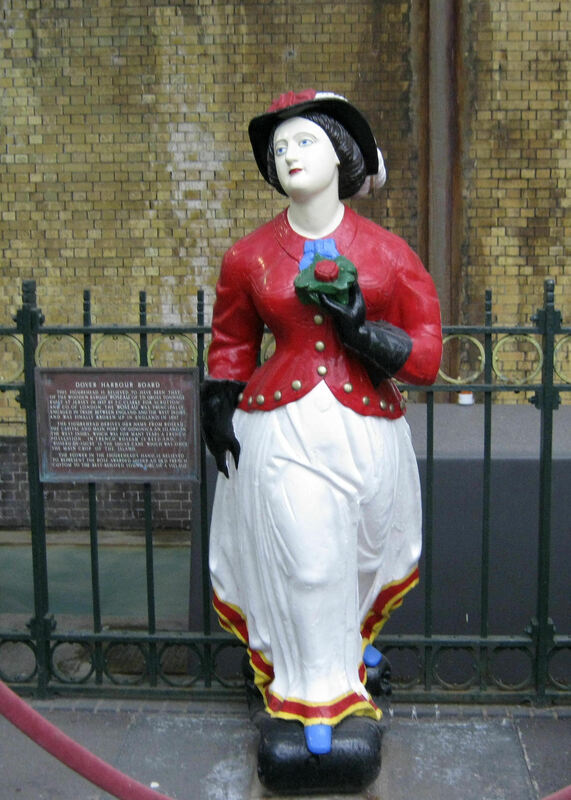 Splendid ships figureheads apparently became the norm of Dover produced ships. By 1696, Nicholas Cullen had amassed sufficient wealth such that by his Will of that year he gave a house and land on Victualling Quay – later Admiralty Yard. The annual income from the rent charge was to be distributed every New Year’s Day to 20 poor widows of the parish. Sadly, when the house was demolished for harbour development this important source of income was lost. Albeit, Philip Papillon, who died in 1719, added to the Cullen Charity by donating rent of £7 a year from 43 acres of land near Lydd that had been mortgaged by the Cullen family. This mortgage was eventually paid off and the land became the freehold property of the charity, which was then sold, and the money invested for charitable purposes. No other Cullen/Cullin family members stood for the council until November 1890, when William Cullin (1839– 1902) was elected to represent Pier Ward and held the seat until he died. Nonetheless, the Cullen shipyard was to continue producing ships and boats until the 20th century and was the last of Dover’s shipyard heritage. 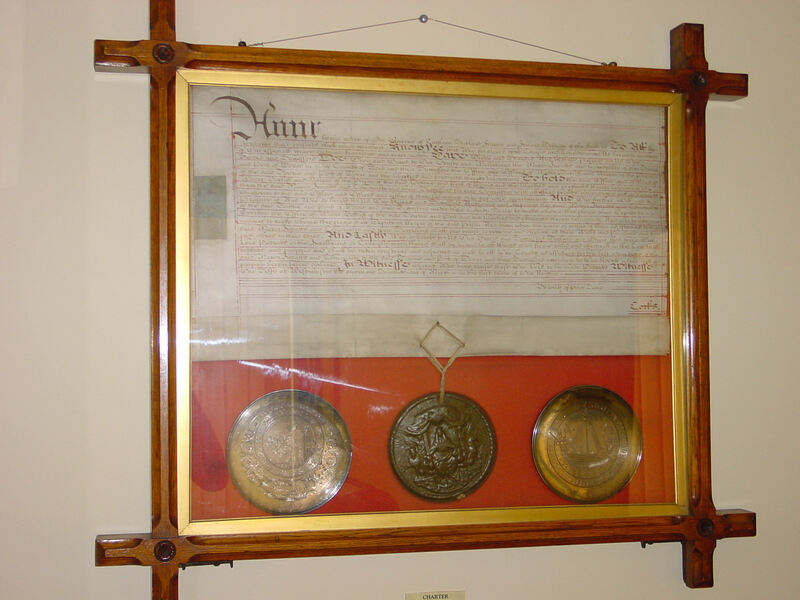 Letter’s Patent in Maison Dieu House, issued by Queen Anne (1702-1717) that sanctioned the creation of the Bason – later Granville Dock and the Tidal harbour. Dover Town Council. Dover’s shipbuilding from the beginning of the eighteenth century is looked at in part 2 the Shipbuilding story. The final section of this part deals with some general aspects of Dover’s shipbuilding applicable to both parts of the story. On receiving an order, the first thing shipbuilders like Nicholas Cullen and successive Dover shipbuilders would have had to consider was the length, depth and breadth of the ship. From this the draughtsmen would draw up the plans to scale on a special type of paper produced by Dover’s paper manufacturers. The plans would be highly detailed giving an account of what would be entailed. From this a wooden model was made using scaled down measurements and showing the final construction with the lines and curvatures. An example of one such a model, the 80ton sloop King George built about 1780, possibly by Dover’s King shipyard can be seen in Dover Museum. From the model and the specification charts, the lines of the final vessel were laid down in the moulding loft of the shipyard. 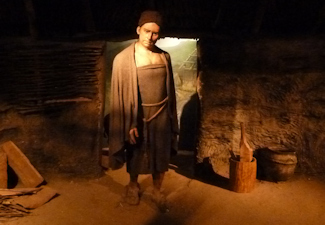 Moulds were made in which the shape of the timbers was formed and the most favoured wood used was Querius Robur oak. At this time Querius Robur oak was grown in the woods that then surrounded Dover at Whitfield, Temple Ewell, Alkham, Lydden, Elham and Lyminge. Tall trees from the centre of the forests were more likely to have long trunks that could be used to make the longest planks and the largest beams and the straight-grained wood could be cleft – split. Trees from the edges of the forests were more likely to have branches growing out at a 90º angle and therefore of use for knees – L-shaped brakets that strengthen the join between the main deck beams and the side of the ship. Approximately 40acres of oak were used for each galleon type ship and the felled oak was taken to the timber yards. Approximately 40acres of oak were used for each galleon type ship and the felled oak was taken to the timber yards. The wood would then be seasoned or dried out, to reduce the weight and chances of decay and improving load bearing properties, among many other attributes. Wood seasoning took place in special sheds some 45feet by 25feet with louvered gables to keep out the rain. Each shed contained four interior racks, all about 5feet apart upon which the timbers were stacked in a way to allow the full circulation of air. After the timbers were seasoned satisfactorily, the shipbuilder would choose the pieces for the principal parts of the ship based on their shapes. This was called converting and in selecting the wood for the curved pieces, the shipbuilder together with the timber yard specialists would use their own judgement and experience. The objective was to select timber with the natural shape as close to the required curve in order to avoid cutting across the grain. When the choices were made the timber, suitably marked, was transferred to the shipyard where it was prepared and then put into place on the ship. The sawyers ‘broke down’ the logs and this was achieved by rolling or carrying the logs on to trestles, indoors this would be over a sawpit. Two strong men, sawyers, one working top and bottom would carefully choose the best cuts and then using a double handled saw make long and accurate cuts. The resultant timbers would then be seasoned or dried out, to reduce the weight and chances of decay and improving load bearing properties, among many other attributes. The timbers prepared by the sawyers at this stage were used to erect the frame or ribs to support the hull that gave the ship its shape and strength. It was essential that the grain of the wood followed the designed curve of the frame. Because the grain of cleft planking runs straight along the timber, this was of particular use above the waterline and in building the ‘castles’. Thus the cleft planks were resistant to cracking, bending or warping by the extremes of weather. The cleaver skill was highly specialised at creating cleft planks and he would choose wood with a very straight grain. He would then tap wedges, initially very gently, into the grain and then becoming stronger to split a straight timber plank in half. Using the same method, the cleaver would then split the half planks into quarters and eighths etc. as required. Finally the required size plank was dressed, using an axe, to make it smooth. Knees were not sawn but hewn, that is chopped from the tree and then carved to the required shape using an axe and an adze – an axe with an arched blade at right angles to the handle. ‘V’ shaped timbers were treated in a similar fashion and of particular use in creating ‘rising floors’, such as the ribs at the bow of the ship. Hewing was another highly specialized skill, using an axe, they would first remove the bark and the sapwood from the L-shaped or ‘V’ shaped timber and with the adze, create the required shape. Starting from the keel, the floor timbers, which cross the keel and join the frame to the keel, are fitted. Then the futtocks or middle timbers were erected, from the base to the top to support the timbers that were attached lengthways from the bow to the stern called stringers, strakes and clamps. Clamps supported the deck beams on which the deck was laid. All of this was undertaken by skilled joiners, sawyers and scarfers (shaper of the wood) used specially designed tools while the ginders used a selection of special knives and other tools with which they moulded, planed, grooved and tongued the internal fittings. The keel was the ship’s iron ‘backbone’ and along with all other ironwork, making it required the specialist skill of the iron founders and blacksmiths. Blacksmiths were an ancient trade in the town, while the growth of the town’s iron foundries had started in the Middle Ages. Much of the raw ore used, by the 18th century, came from the Weald of Kent and most of Dover’s iron foundries were in the Snargate Street area. Once the keel was laid and the timber frame of the ship was established the stem and stern posts were then erected along with the various constituent parts, including the hull, masts and spars etc. The internal wooden structures were carved, fitted and varnished along with the iron and brickwork, particularly in the galley where there was always the danger of fire. While all of this was going on the sails and the ropes were ordered. Sailmaking was a highly specialised skill that involved whole families even though only the males served an apprenticeship. Up until cotton was imported sails were made out of woollen cloth or linen. Woollen cloth, although flexible was heavy when wet and would tear easily. Linen was strong but was also used for other things, most notably military and naval uniforms, the demand for which increased the price. Further as sails became larger, linen proved to be too heavy to be practical and as cotton became more readily available, increasingly became the fabric of choice except where the strength of linen was more serviceable. Sailcloth is often referred to as duck, from the Dutch word for cloth and the traditional width was 24inches. A sail loft is the traditional name for the place where the sails were cut and sewn. These were large rooms with big windows in the ceiling to provide light. The wooden floor was even and smooth and down one side was a wide, long flat wooden table under which the sailmakers tools were stored and next to which those sewing the cloth sat. An experienced sail maker calculated the draught or belly of the sail from which the template was made. This was laid on the floor and strips of cloth were placed, marked off and cut, using a special sharp knife. Sewing the sail was a highly specialised skill that required dexterity and strength as very strong twine was used. This was held in a specially designed compartment next to where the sailmaker sat. Serving as a thimble for sewing with this twine, they wore a leather sailmakers palm and to provide tension to their work and to make sewing easier, they used a sharp pointed hook. A leather maker’s awl was used to make the holes through which the needle passed. The needles were specially made at the iron foundry with sharp triangular points and they were pulled through the sailcloth using pliers. The outside edges of the sails were finished with hems, on which a leech rope was attached, along with rope loops or cringles, for the ropes. To secure the sail to the yards rope holes, called eyelets, were punched into the sail and finished with strands of rope called grommets. 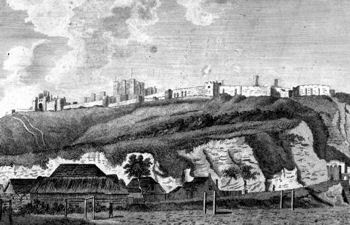 Although ropemaking was a major trade in Medieval Dover, after the turmoil of the seventeenth century it seemed to have all but died out by the late seventeenth century. For this reason Charles I employed Dutch experts to give instruction on its manufacture and Thomas White, later followed by John Goodwin, were Dover’s main rope manufacturers. Rope was made using hemp yarn, nettle or flax yarn and if it was likely to be constantly in water, it was soaked in pitch and tallow. Hemp yarn was preferred but within the trade there were many different qualities and Dover ropemaker, Thomas White, reported in the early eighteenth century that he had in store 48 reels of French yarn from a Mr Crucifix of Dieppe. It was a poor quality and at the time he could not make it into ropes so he wrote, ‘knowing that it will be damnified if it lay all winter, being full of sand.’ Thus, he wrote that it would have to be laid out, aired and tarred, to preserve it. The traditional method of making rope started by tying lengths of the preferred yarn to a hook that was attached to a wheel which was slowly turned whilst the Walkers, as they were called walked down a ropewalk that was about a quarter of a mile in length. Women were usually employed and they fed additional fibres from a supply they carried as need necessitated. At the same time they would be winding the twisted length into a ball. The length was stretched over wooden hurdles placed equidistant apart along the ropewalk – which was also used for herring hanging (drying). The initial length of yarn was the warp or core of the rope was made using the full length of the ropewalk, which had stout hurdles at each end. On reaching the end, the walker would loop the core on the stout hurdle and then turn round and using the core as a base, add more fibres from the basket until the other end was reached. This the would carry on doing until the required thickness of the rope was achieved when it was removed, cut and finished off by the skilled ropemakers and ropebenders. If a thick rope was required, the same method was used, using a length of the basic rope as a core and twisting more prepared rope round it. If shorter lengths of rope were required, the spare length was cut off and then spliced with other rope pieces of the same thickness to form a rope of the desired length and was sold off cheaply. Over time, as ships became taller, the length of the ropewalk increased accordingly such that rope makers were able to produce ropes of up to 300 yards (100 metres) in length. A legacy of this craft is the Ropewalk, a terrace of houses at Aycliffe and named after Dover’s final ropewalk. South Eastern Railway Company in 1843 displaced the others, nearer the beach, for sidings and track. Other trade skills required in shipbuilding included caulking. Oakum, hemp fibre usually twisted pieces of old rope a job – in Dover given to prisoners in the town’s gaol – and then soaked in pine tar. The making of which was the specialist skill of the tar makers. There were also coppersmiths who made and cut the metal to fit on the ships’ bottom. As ships were built of wood they were vulnerable to shipworm (toredo) and the copper sheathing proved to be an excellent deterrent. 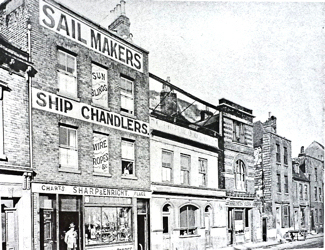 Chandlers specialised in finding or making up to date navigational equipment, charts and bedding and software, while the furniture makers made ships specialised wooden furnishings. Painters carried out decorating while artists/woodcarvers provided the ship-figureheads that decorated the bows of the Dover ships. Members of families involved in Dover shipbuilding from the late 17th century included: Alderton, Allen, Austin, Becker, Beeching, Bishop, Blackford, Bromley, Clark, Cowley, Cullin, Dane, Day, Debenham, Divine, Duke, Enright, Ewell, Farley, Finch, Finnis, Freeman, Frost, Gilbee, Gill, Glandfield, Going, Gravener, Gutsole, Hart, Hedgecock, Hubbard, Hill, Ismay, Jell, Johnson, Kemp, Kennett, King, Ladd, Large, Osborn, Pascall, Philip, Pilcher, Pittock, Poole, Popkiss, Randall, Ratcliff, Richard, Robinson, Scott, Sharp, Shilson, Simpson, Smith, Spice, Steriker, Taylor, Thomas, Thornton, Thorpe, Tolputt, Verey, Vincer, Walker, Walters, Witherden, Worthington and Wrightson. In Part II of the story of Dover Shipbuilding looks at the golden age of Dover’s shipbuilding industry from 1700 to 1793. This entry was posted in Armed Services, Businesses, Cinque Ports, Maritime, Shipbuilding Part I Bronze Age to 1700, Ships. Bookmark the permalink.